Discovering that you have a new, little bundle of joy on the way should not be the end of your boating career. With a few adjustments to your normal boating style, your little angel can be an ideal second mate. From babies to toddlers, here are some tips to consider when bringing your little one out on the water with you. The first thing to consider is safety. This is often the reason people stop boating when they have babies. But family boating can be a great experience once you know the basics of boating safely with kids. 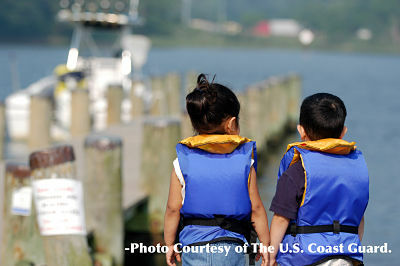 The official source for boating safety advice is the US Coast Guard (USCG). The USCG also provides a list of resources that can provide safety lessons, educational tools, and other helpful study material for boating families. The bottom line? If you love boating, your kids can, too! Here are some tips to get you started so you can ensure your baby remains happy and healthy while boating. The USCG provides an easy-to-read brochure titled “How to Choose the Right Life Jacket,” which outlines great advice for choosing a life jacket or PFD for children and the whole family. Life Jacket that is designed for possible immersion and requires little maintenance. Some of these PFDs can include features such as an inflatable cushion called “heads-up,” which is designed to keep your child’s head out of the water even if they are unconscious. However, remember that the “heads up” feature may not always work. Be sure that you take great care of your child’s life jacket (thoroughly dry it before stowing) and follow all of the care instructions that come with the PFD to ensure that it will work properly if an emergency occurs. The rule of thumb for babies and layers is that they should be wearing one more layer than you are. Because boats are wet areas, make sure you have enough clothing to keep your child dry and warm through rain, waves, or anything else you may face. Top things off with a water-resistant sun hat that ties underneath the chin, so it will not blow off in the wind. If your baby will wear sunglasses, they are a good idea as well. As a rule, the most important base layer should always be a good, baby-safe sunscreen. If you run out of fuel or the wind just won’t get you back when you would like, you might do all right without eating a few extra hours; however, a baby will not do quite as well. It is a good idea to have two extra meals on board for your baby at all times. A lot of this food can be nonperishables like jars or tubes of baby food, an extra jar of formula, or toddler snacks. For fresher, more perishable items, a small cooler is an easy thing to bring along. Of course, this is not the only kind of emergency to plan for. Be ready with many extra diapers for a day of blowouts, surprise rain, heat, and wind. And always be sure to pack the first aid kit. Once safety is addressed, you can focus on the real reason you go boating. There is no better way to get your child to love what you do than to share things with them, and do so on their terms. Here are some good ways to make boating an age-appropriate kind of fun without sacrificing the kind of boating you have always loved yourself. If you are used to long periods of travel time to get to where you are going, you may want to start with shorter trips to begin with. Another option is taking some breaks to island hop, take a dip in the water, or just slow to an idle to allow your little one some run/crawl time. Babies do best if they have some time to do their developmental thing and you will have a much happier travel companion if you plan fun breaks into your travel time. Babies are sponges, and the water is a great place to teach your baby a lot about the world. From using proper nautical terminology on the boat, to pointing out the spinnaker colors on various sailboats around you, to buying a bird guide and learning the different water birds, learning opportunities abound. If these are not topics that you find fascinating, then work with the things about boating you do love, even if you end up teaching your six-month old all about proper engine maintenance. As they get older, and develop their own interests, be willing to add those topics to the lessons as well. If your first mate just wants a day on the water and your toddler is hard to keep focused, then create the kind of trip your toddler will love. A day of cruising can easily become a search for pirate treasure, a voyage around the world, or a chance to read maps and find new destinations. Anything has the potential to be a part of the adventure: Find five sailboats­ – it will help us chart our course. Close your eyes and point on the chart – and this will be our destination. Find ten gulls – you will get the next clue to our location. Work with the interests of your toddler and plan enough themed activities to last the day. Not sure what to do? Research parenting articles on the Internet. There are many great ideas to find and use. Sea Shanties have been a part of many cultures for centuries. They are also wonderful ways to engage a child, from infant to toddler to tween. Though you can begin with baby songs if you want, any song that you are willing to sing will work. If you can find songs that the whole family is willing to sing, the more, the better. If you are part of a musical family already, then consider looking for songs that are about adventures, or the theme that you have chosen for the trip. Babies, and people in general, vary as far as the amount of structure they need before the world becomes stressful for them. Aware parents know what the time limits for their child usually are, and they either work within that time frame, or figure out ways to make things more comforting for their child when it is not possible. If this is a new adventure for your baby, then watch for your child’s signs of stress. Common signs are unusually frequent tantrums and changes in eating and sleeping habits. Babies who boat can easily adapt into children who boat. They can be less likely to become seasick, more comfortable in a life jacket, and can walk with ease with the motion of the water. As they grow older, be sure to begin to give them their own jobs on the boat, from steering to knot tying, and allow them a chance to fully learn and be appreciated for their skills as a member of the family. Enjoy every moment, for it will feel like mere seconds before you are taking your grandchildren on the boat, and beginning all over again.